Time to cap off the week with a retro review. As you most likely know by now, Mario Tennis Open (3DS) is due out in less than three weeks in North America. 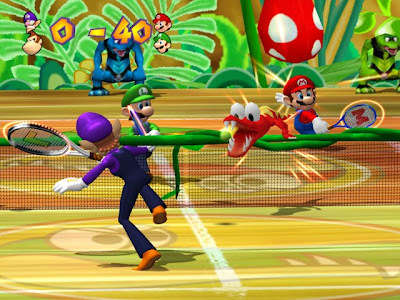 It seems as good a time as any to take to the court for some practice with the GameCube's Mario Power Tennis. Tennis isn't a sport I was put on this earth to enjoy. In fact, I find the act of watching tennis to be incredibly boring. I can only imagine how it is to see it live at center court. Eyes looking to the left, then the right, then the left, then the right, ad nauseum as the players volley the ball back and forth in a rally. That's okay, though, as I know the sport is popular throughout the world. However, whenever Mario leaps his way into a sport, I find myself getting more invested in it. This is true with Mario's GameCube tennis escapade, Mario Power Tennis. Is this version of tennis an ace or a double fault? 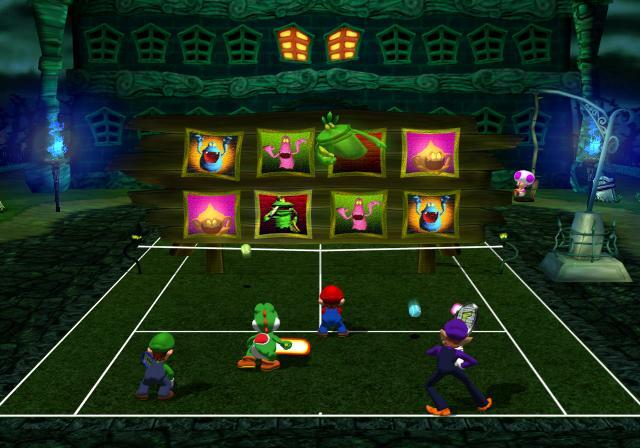 There are a myriad of modes to partake in inside the wacky world of Mario Power Tennis. The main attraction here is Tournament Mode which pits you against a vast array of Mushroom Kingdom characters in order to earn the coveted trophy for each cup. There are three cups: Mushroom, Flower, and Star. As you progress through each tournament, the competition gets tougher and the sets you must win become greater. Tournament Mode is set up for singles as well as doubles play. Unfortunately, you cannot play with a buddy in tournaments; you are forced to work with a computer character. As you complete tournaments, you not only unlock one of four secret characters to play as, but winning the Star Cup of a singles tournament gives whatever character you played as a star, giving them more abilities in a given match. 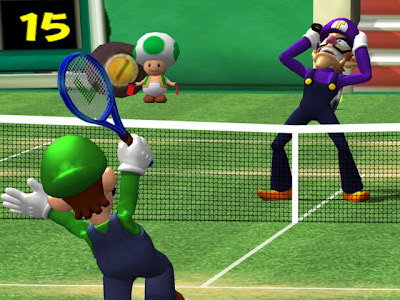 Mario once again takes to the court! Outside regular tennis that generally takes place on the Peach Dome trio of grass, clay, and hard courts, there are gimmick courts which add a flavor of Mario's fantastical elements into the sport. The Luigi's Mansion court is haunted with a plethora of poltergeists which will attack their victims, slowing them down, as well as throwing slippery banana peels all over the playing surface to trip up players. Meanwhile, the Gooper Blooper court hanging above the waters of Super Mario Sunshine's Ricco Harbor has sliding floor panels which move once a ball hits them, revealing holes. If a ball hits these holes, the ball is considered "out" and your opponent gets the points. Another example of a gimmick court is the DK Jungle court where the always-annoying from Donkey Kong Country Klaptrap enemies will attach themselves to players, slowing them down. There are a total of ten courts-- including the three variants of Peach Dome-- to play on. all of these Klaptraps on the court! In addition to the gimmick courts are concepts like Item Battle and the fan favorite Ring Shot. Item Battle has Mario Kart's item boxes spread across the net. Each time a ball passes through an item box, the player that hit the ball receives a helpful item such a Mushroom (speeds your movement up), a Star (grants invincibility), or a Red Shell (homes in on your opponent to knock them out temporarily), to name a few. Ring Shot pits two opponents or two teams against one another, hitting balls through rings to score points. The side with the most points at the conclusion of the game is determined as the victor. Send back all of this big, bad Blooper's shots to win. Apart from typical tennis and the aforementioned eccentric modes come Special Games. These put your numerous tennis abilities to the test in various scenarios. In Artist on the Court, you hit multiple colored paint balls into a wall in an attempt to paint a mural of a character. Hitting shots accurately to touch up various portions of the painting is key to getting a good time. Meanwhile, Gooper Blooper Volley is a test of endurance as you hit back all of the shots of the titular boss enemy. If you miss a shot or hit a ball onto a space marked with an "X", your game is over. There are eight or so Special Games to play, some of which need to be unlocked. Each game has multiple levels to complete with each level becoming increasingly more difficult to complete. Usually you have less time to score more points or some other kind of stipulation that is against you. Up to four players can join in on the Special Games fun. 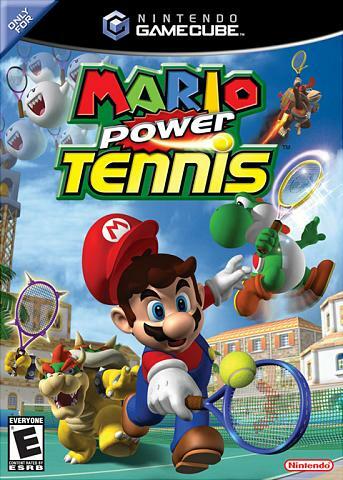 As for the actual gameplay of Mario Power Tennis, it is incredibly accessible to any player's skill level. The controls couldn't be easier. There's buttons for slices, topspin shots, lobs which send the ball high into the air near the back of the court (perfect against players that play near the net), drop shots that aim for the front of the court on a low trajectory, and smash shots. Smash shots occur when the ball is hit high into the air and a star appears on your side of the court. If you hustle on over to the star, you can press the A and B buttons to perform a powerful and speedy smash shot. All of these shots can be charged up to be launched at a fast velocity. Your opponents won't know what hit them. The "Power" part of Mario Power Tennis refers to the various power shots players can use on one another to unleash vicious offensive or defensive maneuvers on their opponents. As you volley the ball back and forth between you and your adversary, your racket will begin to glow. At full power, you can dish out a power shot. Depending on your position in relation to where the ball is you can let loose either an offensive or defensive power shot. 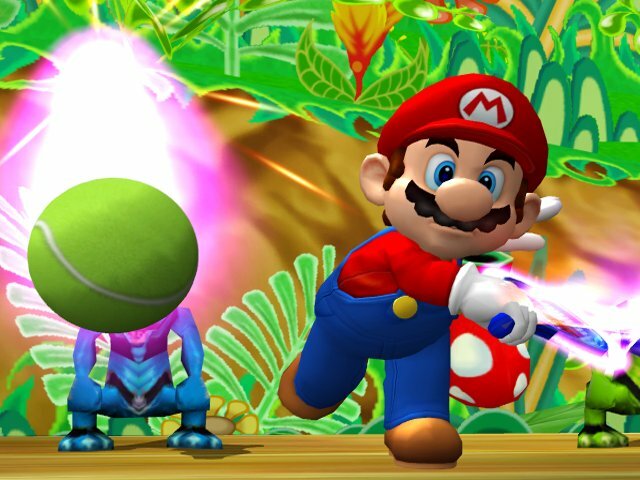 If the ball is right in your line of sight, you can use an offensive shot such as Mario's heavy hammer power shot which hits the ball at a high speed. If your opponent hits the ball back, they will momentarily be pushed back deep within their side of the court. Likewise, defensive power shots are used when you are far away from the ball with no hope of getting to it on your own. For example, Luigi's defensive power shot has him strapping on his Poltergust 3000 and sucking up the ball from wherever it may be. He can then send the ball to his opponent's side of the court. Power shots are surrendered if you block an offensive power shot. However, you won't be hit deep on your court's side. 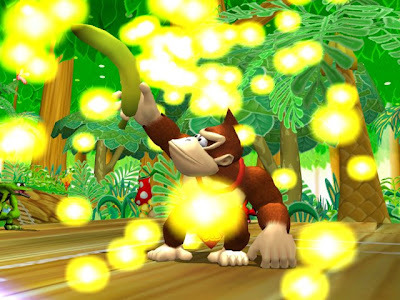 DK's defensive banana boomerang grabs far away shots. There are eighteen characters in all to play as (four of which are unlockable through Tournament Mode). Each has their own power shots and proficiencies. All-around players like Mario and Luigi are good in every category while Technical players like Peach, Daisy, and Shy Guy can hit shots with better accuracy. Then there are Power players who can hit the ball with such strength that they will hammer the ball down your throat. Other categories include Speed players such as Yoshi and Diddy Kong, Defensive players like Waluigi, and Tricky players in the vein of Boo and Bowser Jr.
Mario Power Tennis runs at a steady framerate in order to keep up with the fast and frenetic action of the sport. Characters are modeled well, and the courts are lively background and foreground. The game can become cluttered with too much color at spots which may blind some players or make it challenging to see where the ball is. The voice work isn't too grating, and the soundtrack by veteran composer Motoi Sakuraba fits the happy-go-lucky realm of the Mushroom Kingdom quite well. The opening cutscene is also highly hilarious to watch if you enjoy lighthearted fare. 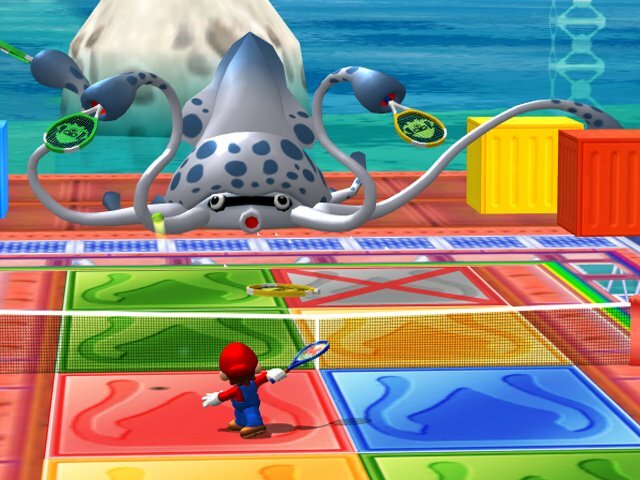 One of the two unlockable courts in Mario Power Tennis. While not perfect (I can take or leave the addition of power shots), Mario Power Tennis (stay away from the Wii's New Play Control version) is a welcome addition to the exhaustive lineup of Mario sports titles. 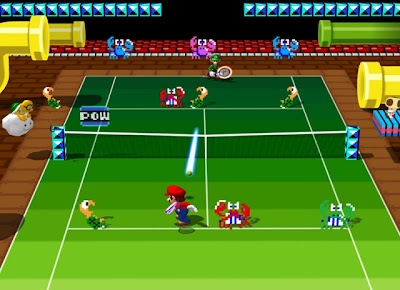 If you are interested in the ultimate arcade tennis experience, then I suggest you look into the Nintendo 64 version of Mario Tennis or the PlayStation Portable's Hot Shots Tennis: Get a Grip. For everyone else, you have a competent and entertaining tennis romp that even non-fans of the sport can enjoy. Mario and friends don't hit a smash shot with this game, but it is a game you'll feel the "love" towards. I personally would hwve given this game 1/10. in the hands of a decent player who has a basic idea of the tactics of tennis, Petey Piranna is unbeatable. his knockback ability ruined the game. The N64 game was better balanced and imo a superior experience. Now the New Play Control! version on Wii? That's much closer to a 1/10. And I agree with you on the last part.